Mosquitoes are the uninvited guests at barbecues, picnics, parties, and pretty much any backyard activities in the summer, they bite you and your guests and spread disease. The mosquito specialists at Weiss Lawn Care, Inc. are here to help. Mosquitoes are most active during their feeding times at dusk and dawn, but when they are not feeding they are resting. 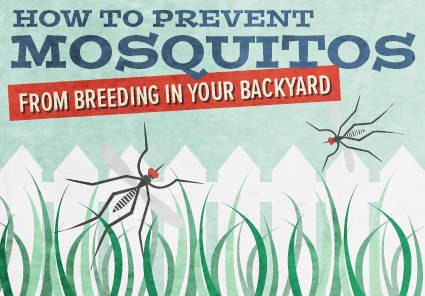 Mosquitoes typically rest in bushes, shrubs, and other vegetation near their feeding grounds, aka your backyard. Our mosquito control applicator will come out during the daytime while the mosquitos are resting and spray a barrier protection on the vegetation throughout your yard. This application will kill the mosquitoes that are resting in these areas upon contact and also put a residue on the vegetation that will kill and deter future mosquitos that land on those plants for up to 21 days. This service comes with a 100 percent satisfaction guarantee. If you are not happy with the results of your application we will come out and re-spray your property again for free. We offer one time applications for special events or our preferred season long plans where a specialist will return every three weeks for maximum mosquito control all summer long.